12 Year Old PowerBook 2400c Apple's First Crossover Notebook? A dozen years ago - on May 8, 1997 - Apple announced the PowerBook 2400c to fill the subcompact Mac laptop slot vacated by the discontinued PowerBook Duo 2300. The 2400c didn't begin shipping until August of that year, at what today seems an astronomical price of $3,499 (more than today's 17" Unibody MacBook Pro). Built for Apple by IBM Japan, the 2400c (code named variously "Comet" or "Nautilus") was based on the PowerBook 3400c/180 motherboard architecture (there was a 240 MHz version introduced April 7, 1998 as well) with 256 KB level 2 (L2) cache. It also had the 3400's video subsystem with a built-in VGA port. It shipped with 16 MB of 60ns RAM and was expandable to 112 MB. It came with a 1.3 GB or 2.1 GB hard drive. PowerBook 2400c with its floppy drive. The 2400c was small, sleek, and lightweight (at 4.4 pounds, nearly half a pound lighter than the Duo 2300, and still the lightest Mac notebook ever, save for the MacBook Air, although only a smidge lighter than the 4.5 lb. Unibody MacBook). It's 10.5" x 8.5" footprint remains the smallest to date for an Apple notebook. The original operating system was Mac OS 7.6.1, and it supports up to Mac OS 9.1. The 2400c's built-in screen was the 10.4" TFT 800 x 600 color screen inherited from the PowerBook 5300ce. Its NiMH battery offered 2 to 4 hours use between charges. Unlike the Duos, the 2400c had a full complement of standard PowerBook ports, including a GeoPort (an oddball Apple modem technology that never caught on) enabled Serial port, an ADB port, an HD-20 external floppy drive port, an HD-30 SCSI port, VGA video out, stereo sound in and out, a 1 Mbps IrDA Infrared port, and a luxurious two PC Card card slots. In other words, unlike the earlier PowerBook Duos, no mucking about with docks was necessary. 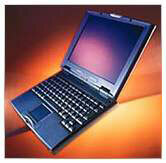 Like the Duo, the 2400's tiny form factor left no room for either a CD-ROM drive or an internal floppy drive. An external floppy drive was included, something that was an extra-cost option with the Duo. There was also a tappable trackpad, a built-in speaker and microphone, 16-bit stereo sound input/output, 1.3 GB and 2 GB hard drives, support for SCSI Disk Mode, support for up to 80 MB RAM (16 MB soldered), an internal slot for 8-bit video or an Ethernet card (Ethernet could also be supported with a PC Card). As tiny as it was outside, internally the 2400c was based on the same speedy PCI architecture as the PowerBook 3400 and offered considerably higher performance than the contemporaneous bigger, "full-size" PowerBook 1400. The 2400 was not intended to be marketed outside Japan (it never did make it to Canada), and it was designed with a smaller than standard sized (87%) keyboard - even smaller than the Duo's and shades of the better netbook keyboards today. The good news was that small though it may have been, but the 2400's scissors-action keyboard is smooth as silk, and Apple used the same technology for the superb G3 Series PowerBook keyboards. Most users reported that they got used to the 2400c's smaller keyboard quickly. Like the 1400, the 2400 had its processor mounted on a daughtercard, making it upgradable to G3. Both Newer Technology and Vimage at one time offered a selection of G3 upgrades for the PowerBook 2400, and for a while, the 2400 with Vimage's 340 MHz upgrade installed was technically the fastest PowerBook in the world. However, upgrades for the 2400 have long been off the market. Unfortunately, the PowerBook 2400c had a very short production run and was not immediately replaced. 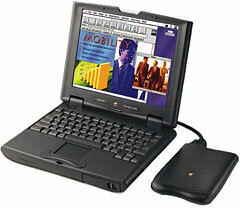 There was a fairly long stretch between discontinuation of the PowerBook 2400c in 1998 and the introduction of the Dual USB iBook on May 1, 2001, during which time there was no subnotebook Mac laptop at all (the clamshell iBook was bigger and heavier than the contemporaneous Lombard and Pismo PowerBooks). The PowerBook 2400c is one of several small Mac laptops - including the Duo, the 12" PowerBook, and even the MacBook Air - that I've admired but never owned. I think I would have enjoyed the 2400c. My new Unibody MacBook is the smallest and lightest Mac I've had so far, and I'm delighted with it, save for the lack of FireWire support. I was a big fan of my 12" iBook as well over its six-plus year lifespan. Interestingly, aside from its astronomical price by today's standards, the PowerBook 2400c, with its 10.4" display, smaller than standard keyboard, external drive, and small size - 1.9" H x 10.5" W x 8.5" (4.8 cm H x 26.7 cm W x 21.6 cm D - could arguably be considered a crossover netbook before its time compared with some of the higher-end netbook/notebook crossover machines coming on the market from PC vendors. It compares quite similarly in form factor, except for thickness, to the new Averatec crossover 12" notebook ( 11.6" W x 8.9" D x 1.2" H and 4.0 lb.) and Samsung's 11.5" x 8.5" x 1.2", 3.0 lb., 12.1" display NC20. There is precedent for an Apple netbook - or at least a crossover 'Book - including the original, Sony-built PowerBook 100 from 1991. Apple could do worse than dust off the PowerBook 2400 form factor, do some reengineering to slim it down, graft in a contemporary Intel CPU and other internals, and there's your Apple netbook-fighter.